The incredible spectacle that the National provides is what makes the event so special to the large number of viewers around the world. It is now estimated that around 500 to 600 million people will watch the race in over 140 different countries which further backs up the point of the popularity of the event. The Grand National provides such a unique test or both horse and rider which is why is draws so much attention from the public. The race inaugurated back in 1839 and has continued to grow over time with a wider audience. Prize money has also continued to grow which now stands at £1 million meaning it is the most valuable jump race in Europe and is the reason why more connections are targeting their top horses on the race. In the past connections of the top Gold cup horses would not contest the race but this has changed in recent times with the victories of the likes of Neptune Collonges and Many Clouds. With the Grand National now just a few months away anticipation is continuing to build ahead of the big race. The favourite going into the race is Blaklion as he looks to improve upon last year’s 4th place finish. It is also worth looking at the amazing Grand National odds on the new Paddy Power site. Check out this infographic so see the key attributes that are required to have success in this famous race. This site is intended for over-18s only. Want gambling help, advice or support? www.BeGambleAware.org. What is a Tipster Service? Where does Horse Racing Tipping come from? How can I become a Horse Racing Tipster? How do I get my tips onto the market? We only take the minimum data required to provide the services (often just a name, password and email address), and will never sell this to a third-party. We'll only send you emails regarding the services you ask for, plus the occasional update if you opt-in when confirming your email address. To change your notification settings, look under your Profile once you've signed up. We don't use any automated decision making software to track you, or move your data outside the EU without strong protections. We do back it up, keep it secure and keep payment records etc as required by law. If you ask us (there's a button under your Profile) we'll delete your data at any time, with the exception of payment data as required by law. 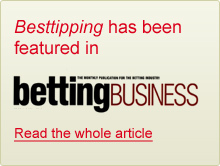 If you want more info about the data we hold, or want us to do something with it, you can always email us at admin@besttipping.com. If you have complaints about how we handle your data you're entitled to complain to the Information Commissioner’s Office. Enter your email address below to have a password reset link sent to you. You must login to view the section of the site you've requested. If you don't already have an account, click here to register for free.